I have not posted a comment lately about the Minneapolis Real Estate market because it really hasn’t changed much in the first quarter of 2007. But seeing as it is the end of the first quarter, I thought you might like to see the statistics. According the the Minneapolis Association of Realtors, buyers are still exercising caution when choosing to purchase a home in the local market. Just because it is a “Buyer’s Market”, doesn’t mean they are actually buying. Pending sales (those under contract) are 14% behind where they were this time last year. 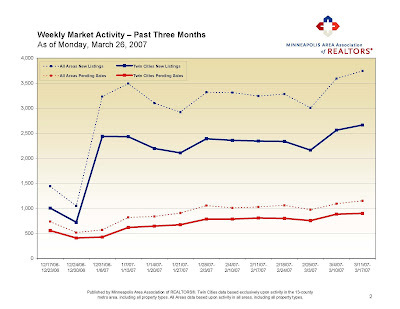 At the same time, listings have increased by 10% above what they were in 2006. Spring has arrived which is usually a good time to purchase, but when sellers wait until Spring to list their home, a huge influx of listings appear and once again supersaturate the inventory. Last fall there were 35,000 listings and now we stand at 29,000. Do note that 19% of this inventory is new construction. That’s alot of new homes….now you know why competition is so fierce. If you are even thinking about listing your home, you have to price it right from the get go or you might never sell. Currently we have a Housing Supply of at least 7 months. This means it will take 7 months for the current homes listed to sell. I doubt many home owners have that long. Most need to be somewhere else yesterday. If you would like statistical information for a certain price range, please feel free to comment and I will update the post!